What's the Difference Between Floor Tile Grout and Thinset? What’s the Difference Between Floor Tile Grout and Thinset? Floor tile grout and thinset are two essential components of any tiled floor or surface in a home or a business. Both of these elements require professional care to install and remove, and the contractor’s use of both materials can affect both of these processes. So, what’s the difference between the two, how do they work, and what’s the best option for a flooring project? When a contractor installs a new tile floor, the first priority is ensuring that they can begin working on a smooth, flat surface with no cracks or holes in it. The flooring of a home or business is an essential part of the entire structure and will likely face lots of wear and tear over the years. For these reasons, it’s important to have a good foundation on which to lay new tile, whether it’s porcelain, slate, or something different. During the floor removal process, after the tile is demolished, it’s vital that the levels below the tile be ground down to a smooth and flat surface so that new flooring materials can be laid. The layer underneath the tile and above the foundational floor structure is referred to as “thinset.” This material is also known as mortar. This is the material that adheres the tile flooring to the floor itself. Unlike floor tile grout, this layer is generally not visible to the eye and sits underneath the tile covering. Thinset is a strong adhesive material that attaches tile to a surface made of cement or concrete. Generally, cement or concrete is the foundational material below any type of flooring, so thinset is very commonly used in the installation of any form of tile flooring. Thinset is made of cement, fine sand, and a material that absorbs and retains water, such as a cellulose derivative. This material is functional rather than aesthetic, and it is not used as a design element but rather as a construction element, to hold the tile flooring to the foundation surface. Handling of thinset requires product knowledge and experience and should only be done by a professional. In contrast to thinset, floor tile grout is both aesthetic and functional. Floor tile grout is a type of material used to fill the spaces between individual tiles. It smooths over these spaces to create a flat and functional surface, but it is also visible in the finished floor. Therefore, different types of floor tile grout can be chosen depending on the owner’s design preferences as well as the type of tile being used in the flooring. As opposed to thinset, floor tile grout affords people the chance to select the color they wish to use. Thinset is not visible once it’s installed, while floor tile grout is visible between tiles. Clients have the option of choosing from a variety of colors in order to match the tile they have selected. 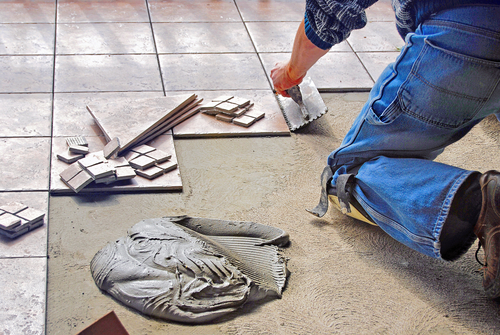 Floor tile grout can contain sand, or finely ground silica, as well as come in sandless forms. It is generally made of a mixture of cement, water, and various binding and reinforcing agents like polymer and latex. It is generally thinner than thinset to allow for easy pouring between tiles, and when mixed correctly, should provide a waterproof seal between individual tiles. Floor tile grout can be selected for color as well as variety, based on the style and the sealing properties a client wishes to have in their floor. Despite their different purposes, floor tile grout and thinset are composed of some of the same materials, including corrosive elements like sand and cement. These materials are necessary to make thinset and floor tile grout strong enough to hold up to years of wear and tear on flooring. However, when tile flooring is removed, the demolition of these materials can release these elements into the air, posing a health hazard. During floor removal, floor tile grout and thinset is chipped by jackhammers and then ground down by industrial floor grinders. This creates a fine dust that can be hazardous to residents of the structure. It can also potentially damage furniture and result in the need for a time-consuming clean-up process after floor removal. Fortunately, the Dustbusters system employs industrial vacuums that eliminate the dust created by grout and thinset before it ever reaches the air. This reduces the hazard of health issues created by dust, protects furniture and surfaces from damage, and eliminates the need for a labor-intensive clean-up. If you need flooring removed without all the dangers and inconveniences of dust output, call Dustbusters today at 866-883-8783.